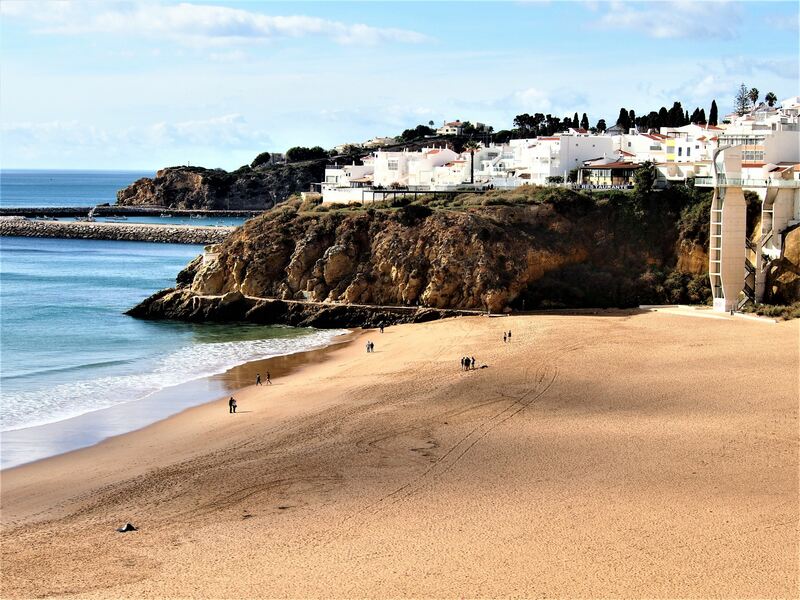 Albufeira​ ​is​ ​Algarve’s​ ​beach​ ​haven. 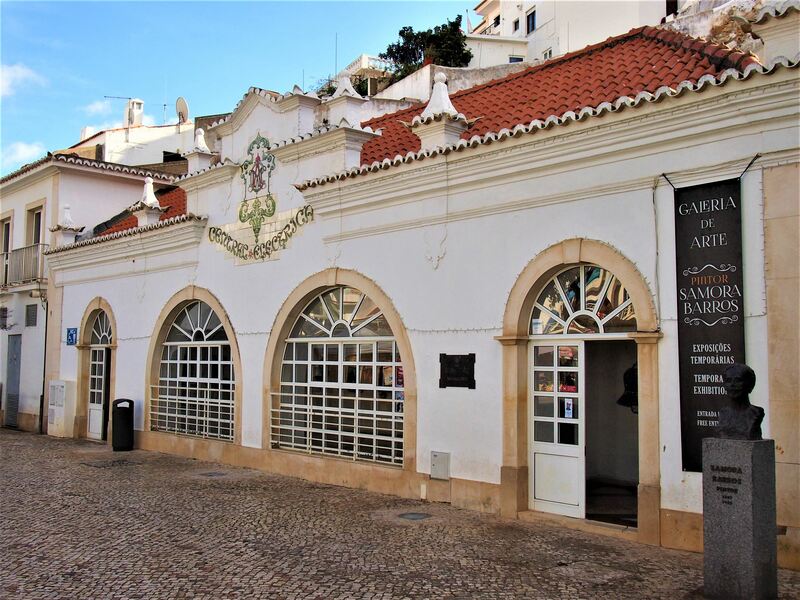 This is our Albufeira 2 day tour and day 9 of our tour of the Algarve in Portugal.​ ​Stretching​ ​30​ ​km​ ​along​ ​the​ ​coastline,​ ​the​ ​city​ ​has​ ​more​ ​than​ ​a​ ​handful of​ ​beaches,​ ​some​ ​are​ ​wide​ ​open​ ​with​ ​long​ ​stretches​ ​of​ ​sand,​ ​while​ ​others​ ​are​ ​nestled​ ​between​ ​rocky​ ​cliffs waiting​ ​to​ ​be​ ​discovered. 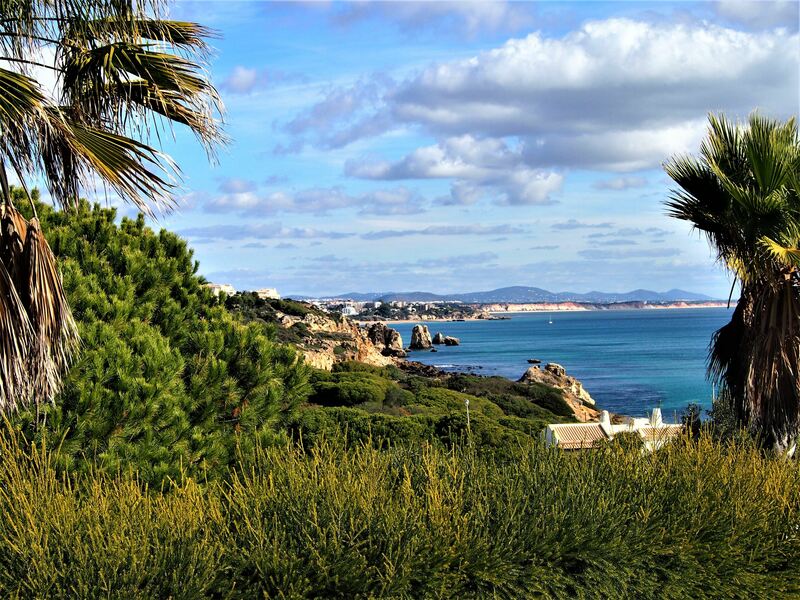 After another delicious breakfast at Quinta do Freixo, I left the mountains of Loulé behind and drove off towards the coastline of Albufeira. 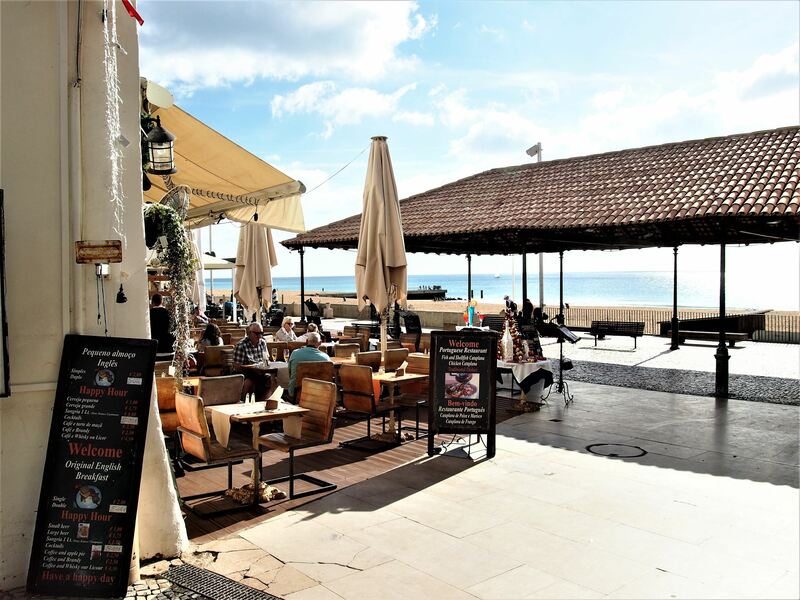 Before​ ​I​ ​headed​ ​down​ ​to​ ​the​ ​seashore,​ ​I​ ​decided​ ​to​ ​learn​ ​more​ ​about​ ​the​ ​city’s​ ​culture.​ ​I​ ​started​ ​by​ ​visiting Galeria​ ​Pintor​ ​Samora​ ​Barros,​ ​an​ ​art​ ​gallery​ ​set​ ​right​ ​in​ ​the​ ​middle​ ​of​ ​Albufeira’s​ ​Old​ ​Town.​ ​The​ ​gallery​ ​is named​ ​after​ ​the​ ​painter​ ​Samora​ ​Barros​ ​who​ ​was​ ​born​ ​in​ ​Albufeira.​ ​The​ ​building​ ​itself​ ​is​ ​impressive,​ ​with its​ ​bright​ ​white​ ​walls,​ ​large​ ​glass​ ​windows,​ ​also​ ​framed​ ​in​ ​white​ ​and​ ​a​ ​tiled​ ​façade​ ​stating​ ​“Central Elétrica”,​ ​a​ ​reminder​ ​of​ ​the​ ​building’s​ ​past​ ​life​ ​as​ ​a​ ​power​ ​station. After​ ​the​ ​gallery,​ ​I​ ​walked​ ​around​ ​the​ ​Old​ ​Town,​ ​passing​ ​through​ ​narrow​ ​cobbled​ ​streets​ ​dotted​ ​with shops,​ ​bars​ ​and​ ​restaurants​ ​suited​ ​for​ ​all​ ​tastes. 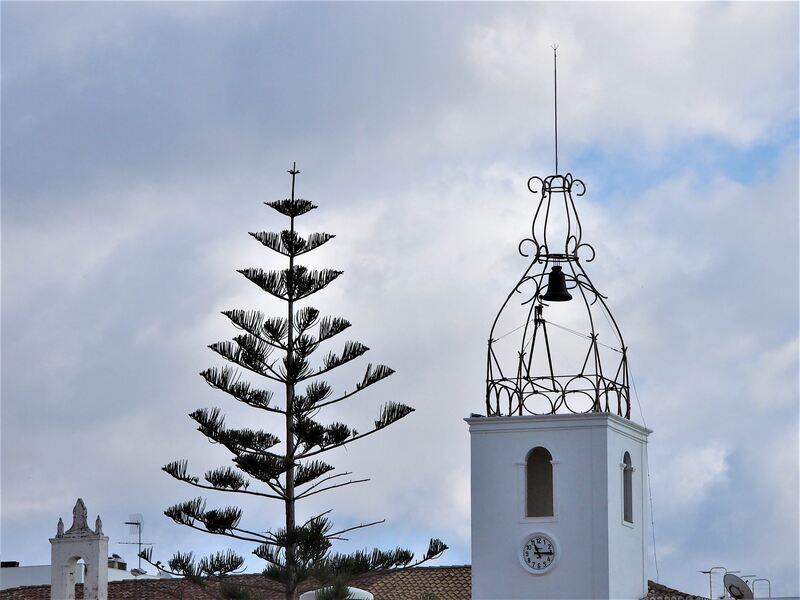 ​I​ ​ended​ ​up​ ​near​ ​Albufeira’s​ ​main​ ​church,​ ​easily​ ​recognisable​ ​by​ ​its​ ​tall​ ​bell​ ​tower​ ​that​ ​still​ ​chimes​ ​on​ ​the hour.​ ​This​ ​neoclassical​ ​church​ ​was​ ​built​ ​in​ ​the​ ​18th​ ​century,​ ​replacing​ ​the​ ​original​ ​church​ ​destroyed during​ ​the​ ​1755​ ​earthquake.​ ​Inside,​ ​the​ ​decoration​ ​is​ ​very​ ​modest,​ ​compared​ ​to​ ​other​ ​churches​ ​around the​ ​Algarve.​ ​The​ ​main​ ​altar​ ​is​ ​adorned​ ​with​ ​a​ ​beautiful​ ​painting​ ​by​ ​Samora​ ​Barros,​ ​that​ ​stands​ ​behind​ ​the statue​ ​of​ ​Nossa​ ​Senhora​ ​da​ ​Conceição​ ​(Our​ ​Lady​ ​of​ ​the​ ​Conception),​ ​the​ ​city’s​ ​patron​ ​saint. 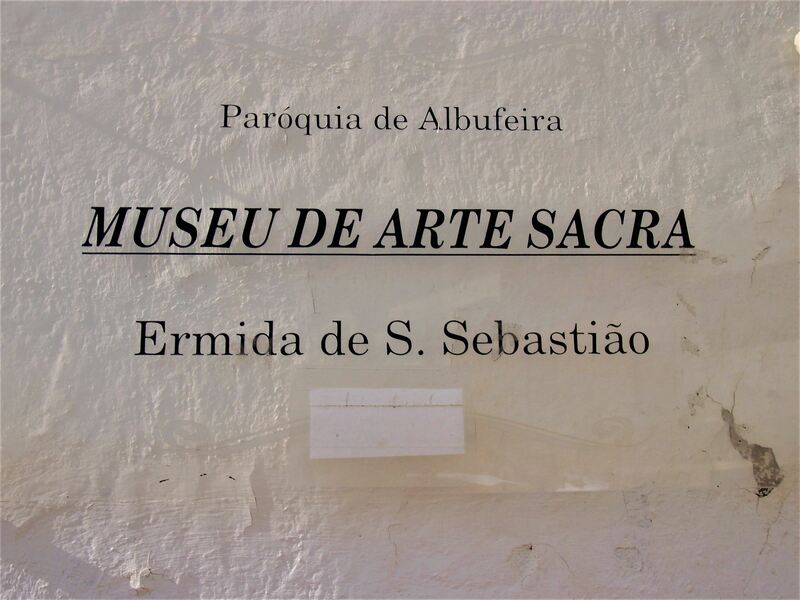 From​ ​here,​ ​I​ ​continued​ ​on​ ​to​ ​another​ ​church,​ ​Igreja​ ​de​ ​São​ ​Sebastião,​ ​which​ ​houses​ ​the​ ​Museum​ ​of Sacred​ ​Art​ ​in​ ​Albufeira.​ ​The​ ​museum​ ​gathers​ ​a​ ​series​ ​of​ ​religious​ ​items​ ​belonging​ ​to​ ​several​ ​churches from​ ​the​ ​region​ ​that​ ​survived​ ​the​ ​earthquake.​ ​The​ ​thing​ ​that​ ​most​ ​caught​ ​my​ ​eye,​ ​however,​ ​was​ ​the section​ ​with​ ​the​ ​handpainted​ ​tiles,​ ​particularly​ ​the​ ​colourful​ ​panel​ ​with​ ​Jesus​ ​and​ ​the​ ​angels. 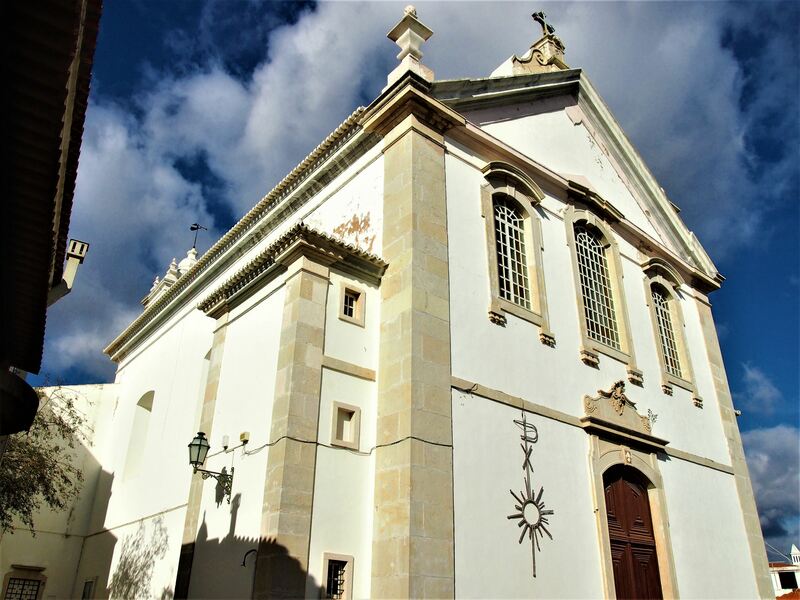 Just​ ​around​ ​the​ ​corner​ ​from​ ​the​ ​church​ ​is​ ​the​ ​Archaeological​ ​Museum​ ​of​ ​Albufeira,​ ​showcasing​ ​the evolution​ ​of​ ​the​ ​city​ ​from​ ​prehistoric​ ​days​ ​to​ ​the​ ​modern​ ​ages.​ ​Beyond​ ​the​ ​permanent​ ​exhibition,​ ​the museum​ ​also​ ​has​ ​a​ ​space​ ​for​ ​temporary​ ​shows​ ​and​ ​a​ ​thematic​ ​library. 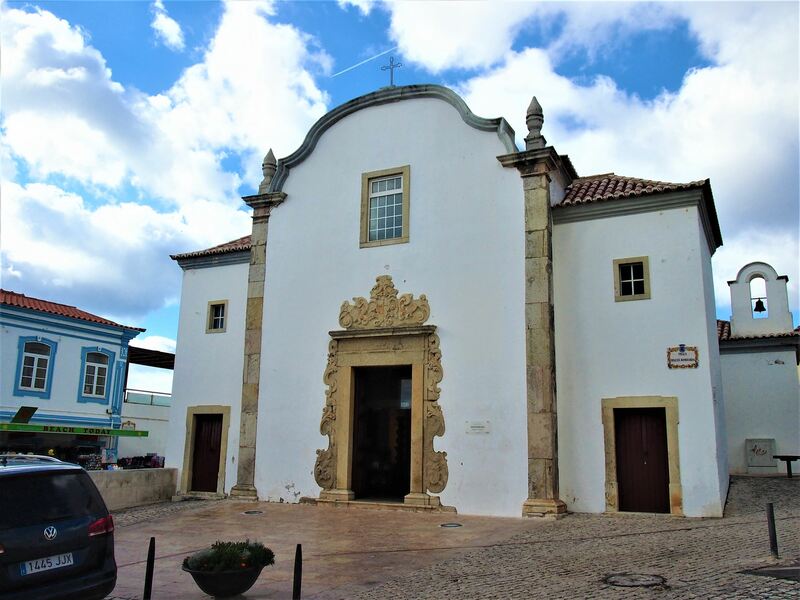 I​ ​left​ ​the​ ​museum​ ​and​ ​made​ ​my​ ​way​ ​to​ ​Cabana​ ​Fresca​ ​for​ ​lunch.​ ​Set​ ​on​ ​the​ ​edge​ ​of​ ​Praia​ ​dos Pescadores,​ ​the​ ​restaurant​ ​provides​ ​an​ ​incredible​ ​view​ ​over​ ​the​ ​ocean​ ​and​ ​a​ ​menu​ ​full​ ​of​ ​fish​ ​and seafood​ ​delicacies,​ ​as​ ​you​ ​would​ ​expect​ ​from​ ​its​ ​location.​ ​As​ ​a​ ​starter,​ ​I​ ​ordered​ ​Camarão​ ​à​ ​Pescador,​ ​a plate​ ​of​ ​fried​ ​prawns​ ​cooked​ ​with​ ​onion​ ​and​ ​garlic,​ ​followed​ ​by​ ​a​ ​delicious​ ​seafood​ ​rice​ ​and​ ​accompanied by​ ​a​ ​glass​ ​of​ ​white​ ​wine. 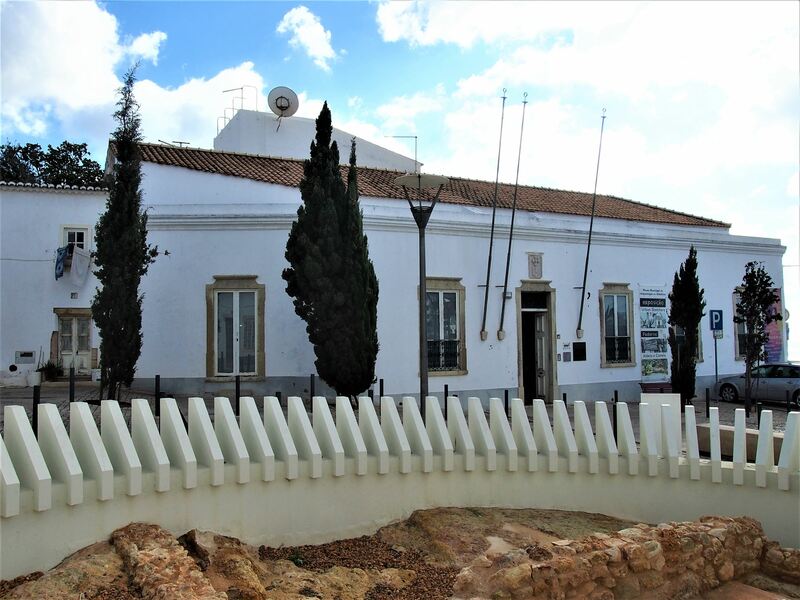 Instead​ ​of​ ​staying​ ​at​ ​another​ ​hotel,​ ​Algarve​ ​Lifestyle​ ​booked​ ​me​ ​into​ ​an​ ​apartment​ ​with​ ​a​ ​terrace​ ​and​ ​a sea​ ​view,​ ​very​ ​near​ ​the​ ​Old​ ​Town​ ​and​ ​the​ ​beach,​ ​the​ ​perfect​ ​place​ ​to​ ​relax​ ​after​ ​my​ ​busy​ ​morning.​ ​I settled​ ​down​ ​at​ ​the​ ​apartment​ ​for​ ​an​ ​hour​ ​before​ ​heading​ ​back​ ​outside​ ​to​ ​visit​ ​one​ ​of​ ​Albufeira’s​ ​most beautiful​ ​beaches,​ ​Praia​ ​de​ ​São​ ​Rafael. 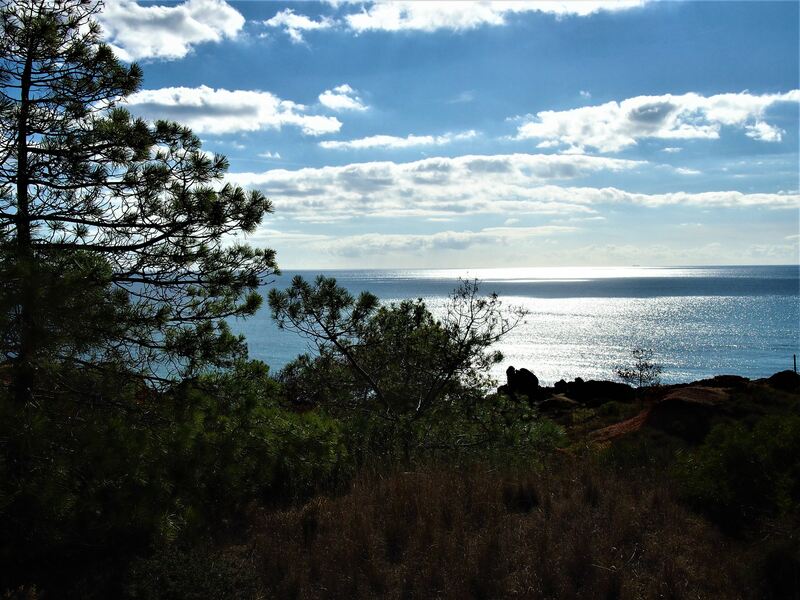 Along this part of the Algarve coastline, Albufeira​ ​has​ ​an​ ​enormous​ ​range​ ​of​ ​beaches,​ ​Praia​ ​dos​ ​Pescadores​ (also known as Fisherman's beach) ​is​ ​the​ ​easiest​ ​one​ ​to​ ​reach​ ​because it’s​ ​located​ ​near​ ​the​ ​city​ ​centre,​ ​but​ ​there​ ​are​ ​many​ ​others​ ​spread​ ​along​ ​the​ Atlantic ​coast​ ​that​ ​are​ ​worthy​ ​of​ ​a visit. 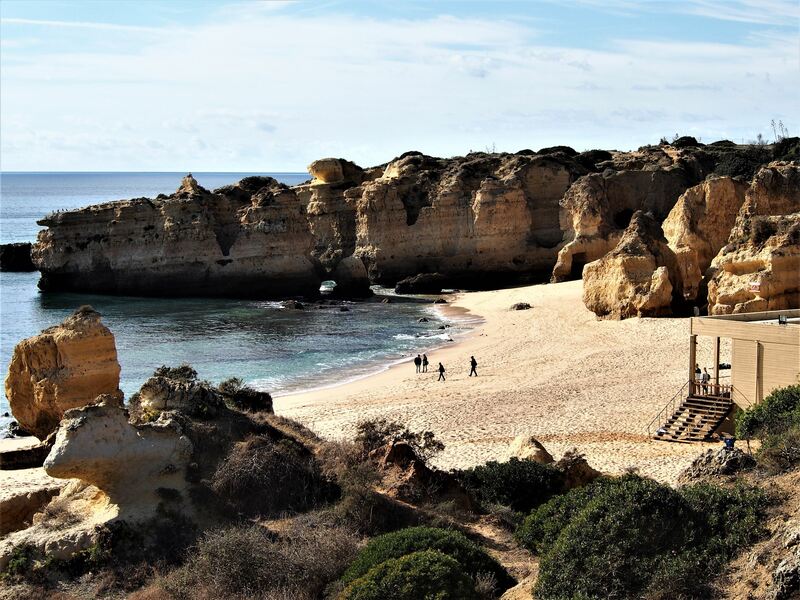 Out​ ​of​ ​all​ ​of​ ​them,​ ​I​ ​was​ ​recommended​ ​Praia​ ​de​ ​São​ ​Rafael.​ ​This​ ​small​ ​beach​ ​is​ ​surrounded​ ​by​ ​stunning orange​ ​cliffs​ ​and​ ​unique​ ​rock​ ​formations​ ​that​ ​have​ ​been​ ​shaped​ ​by​ ​the​ ​wind​ ​and​ ​the​ ​waves,​ ​two​ ​of​ ​them even​ ​have​ ​names​ ​“Ponte​ ​Pequena”​ ​(Small​ ​Bridge)​ ​and​ ​“Ninho​ ​das​ ​Andorinhas”​ ​(Swallow’s​ ​Nest).​ ​Most​ ​of these​ ​rock​ ​formations​ ​continue​ ​under​ ​the​ ​surface,​ ​making​ ​this​ ​a​ ​great​ ​spot​ ​for​ ​snorkelling.​ ​When​ ​the weather​ ​is​ ​nice​ ​you​ ​can​ ​also​ ​join​ ​a​ ​stand-up​ ​paddle​ ​tour​ ​and​ ​explore​ ​the​ ​caves​ ​and​ ​grottoes​ ​near​ ​the beach. When​ ​I​ ​arrived,​ ​the​ ​beach​ ​was​ ​quiet,​ ​the​ ​bathing​ ​season​ ​was​ ​about​ ​to​ ​end​ ​and​ ​there​ ​were​ ​only​ ​a​ ​few people​ ​laying​ ​on​ ​the​ ​sand.​ ​I​ ​sat​ ​down​ ​at​ ​the​ ​café​ ​and​ ​relished​ ​the​ ​view​ ​while​ ​I​ ​waited​ ​for​ ​the​ ​menu. 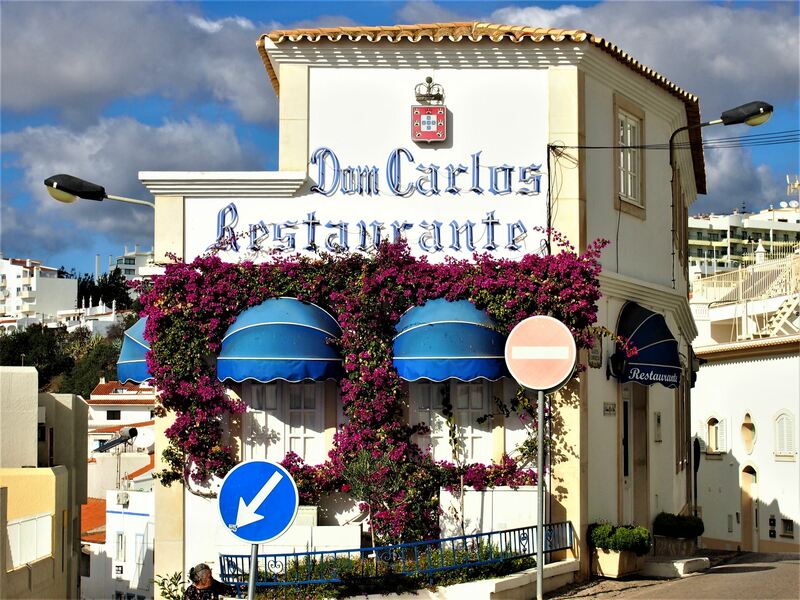 I​ ​had​ ​a​ ​quick​ ​snack​ ​and​ ​then​ ​got​ ​back​ ​to​ ​the​ ​city​ ​centre​ ​to​ ​have​ ​dinner​ ​at​ ​Dom​ ​Carlos.​ ​Considered​ ​one​ ​of the​ ​best​ ​restaurants​ ​in​ ​Albufeira,​ ​Dom​ ​Carlos​ ​is​ ​often​ ​packed​ ​with​ ​customers​ ​so​ ​it’s​ ​always​ ​good​ ​to​ ​book in​ ​advance.​ ​This​ ​charming​ ​restaurant​ ​is​ ​run​ ​by​ ​a​ ​family​ ​duo,​ ​Peter​ ​and​ ​Ana,​ ​who​ ​are​ ​clearly​ ​passionate about​ ​the​ ​food​ ​they​ ​serve.​ ​More​ ​than​ ​a​ ​meal,​ ​I​ ​was​ ​offered​ ​an​ ​exquisite​ ​gastronomic​ ​experience,​ ​with delicious​ ​dish​ ​after​ ​delicious​ ​dish,​ ​starting​ ​with​ ​the​ ​appetizers​ ​all​ ​the​ ​way​ ​to​ ​the​ ​dessert,​ ​a​ ​total​ ​of​ ​five courses. 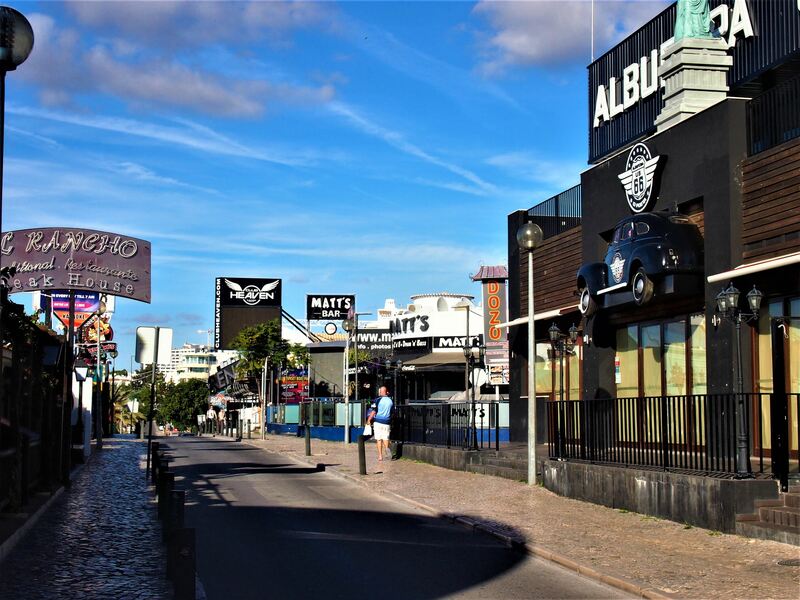 Having​ ​finished​ ​dinner,​ ​I​ ​headed​ ​to​ ​Avenida​ ​Dr.​ ​Francisco​ ​Sá​ ​Carneiro,​ ​commonly​ ​known​ ​as​ ​The​ ​Strip,​ ​to get​ ​a​ ​feel​ ​of​ ​Albufeira’s​ ​nightlife.​ ​When​ ​the​ ​sun​ ​goes​ ​down,​ ​the​ ​neon​ ​lights​ ​brighten​ ​up​ ​The​ ​Strip, exposing​ ​its​ ​long​ ​trail​ ​of​ ​bars​ ​and​ ​nightclubs.​ ​In​ ​the​ ​midst​ ​of​ ​this​ ​colourful​ ​setting,​ ​I​ ​found​ ​the​ ​Blues​ ​Bar, and​ ​it​ ​was​ ​in​ ​this​ ​quiet​ ​pub​ ​drinking​ ​a​ ​beer​ ​that​ ​I​ ​ended​ ​my​ ​first​ ​night​ ​in​ ​Albufeira.